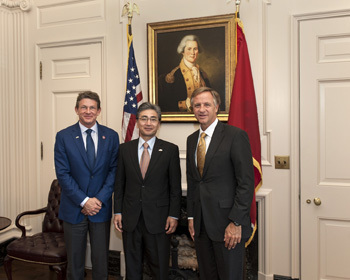 Consul-General Kinefuchi visits Governor Haslam and Commissioner Boyd, Tennessee Department of Economic and Community Development, on April 30th. CG Kinefuchi said, I came to TN just two days ago and have experienced “Southern hospitality” since arriving. I look forward to developing good relations between Japan and TN. I hope to work very closely with people of Tennessee. Gov. Haslam welcomed Consul-General Kinefuchi to Nashville and noted that Japan is a very important partner for TN, with many Japanese companies operating in the state. Haslam also expressed he is looking forward to working with CG Kinefuchi and the Japanese Consulate.